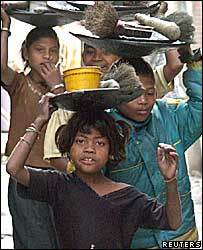 BBC NEWS | South Asia | Will India's rural job scheme work? Will India's rural job scheme work? The BBC analyses the Indian government's ambitious new National Rural Employment Guarantee Scheme, which promises some 60 million households a level of financial protection through guaranteed work or unemployment benefit. India faces a fundamental problem. It is growing economically but its poor, especially in rural areas, are making very little progress. This scheme does not resolve the many underlying reasons for that. Those include social attitudes and access to decent education and health care. It is trying to address those separately. But it could potentially ease the burden of India's poorest sector - by helping them survive crises. If it works, this guarantee of work should act as a safety net for India's most vulnerable, so that when a crisis hits, like drought or illness, they have a basic safeguard. That idea of social insurance fits well with a lot of current development thinking. So does the fact that it is a government-led attempt to transfer wealth from those profiting from growth, to those left behind. But there are concerns. One of the biggest is about implementation. India has a long-standing struggle with corruption and bad governance. This scheme will tap into India's network of panchayats or local councils to decide key questions, like which families benefit. Even so, many people question how transparent it will be and how much of the money will really reach the poor. Some of India's poorest states are also those with the worst reputation for governance. In other words, it is precisely where there is greatest need that the scheme's effectiveness is most in danger. "It relies hugely on the discretion of local officials to identify which people are eligible," said John Farrington, a research fellow with the UK-based Overseas Development Institute. "A lot of money is going to be siphoned off," he fears. It is also unclear what kind of work state governments will offer. Analysts say the projects must be flexible and responsive to the needs of the poor. Is the government mistakenly trying to stop rural-urban migration? 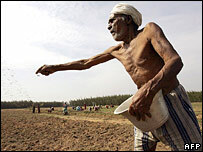 Labourers and farmers may need extra work in particular during low seasons or during drought, for example, but not at other times. If state governments just treat the scheme as a source of cheap labour, largely funded by central government, it will defeat the object. And although this support could mean the difference between surviving a crisis period or not, it is really a sticking plaster. It will not lift people out of poverty. The work will be manual labour, not anything which develops new, marketable skills. Some also criticise the Indian government for its thinking, for what they see as an instinctive attempt by Delhi to curb rural-urban migration. "India has not come to grips with rural-urban migration in the same way as China has, where 40m people, or about 25% of the workforce, has moved," says Mr Farrington. But that is a long-term trend in almost every society, north and south, and some say it is impossible to stop. "In the long-term, that is the way populations have gone," said Mr Farrington, "Agricultural populations diminish. The trick is to learn how to manage it at both ends." In India, if the opportunities lie in urban areas, for example in construction, he argues, it might be in the best interests of the poor to be supported as they seek them out, rather than encouraged to stay in the countryside where there are fewer opportunities. Mr Farrington also says the Indian government is genuinely concerned about expanding its programmes for the poor but adds that, in his view, there are better ways of spending the same amount of money, for example, by investing it in a universal old-age pension scheme. This scheme caters only for the able-bodied. To reduce poverty, he argues, it is also important to think of those who cannot work because they are elderly or ill. 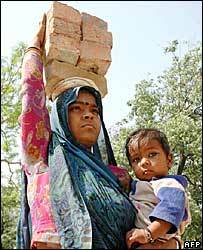 They are some of the most chronically poor. There is no doubt that this is a huge political gamble for a government which came to power with a mandate to help the rural poor. Many of its attempts at economic reform have been diluted or blocked by its coalition partners. India's leaders do seem determined, despite domestic opposition, to tackle poverty in a serious manner and on a grand scale. Their commitment is backed by a lot of money. Much of the objection within India has focussed on the cost, with some critics complaining that such a massive handout by central government is simply too great a burden. Now the big question is whether this grand scheme can actually work. What do you think of the government's efforts to tackle rural poverty? Do you live in rural India? 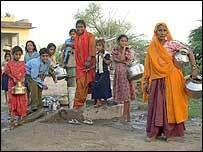 Can you think of other examples of poverty-alleviation among India's rural poor? Send us your comments and experiences.